BT has unveiled its sleek new Home Hub 2.0, complete with 802.11n Wi-Fi, eco-friendly power-save function and kid-unfriendly child controls. 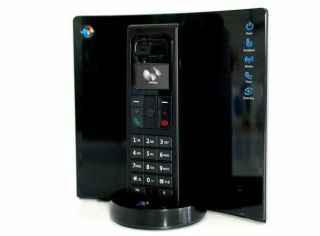 The curved black design of the unit and the matching phone are the most obvious changes from a cosmetic point of view, but it's beneath the bonnet that the new router has altered the most. First up is the adherence to the draft version of 802.11n, allowing users to drift further from the hub – cue a whole series of adverts of surfing from the garden. It's a key change for BT, who are hoping that the growing familiarity of their audience with wireless networking, and the increased demand for Wi-Fi from anywhere within a property and its grounds will make the router a popular option. Jon Hurry, Commercial Director of BT Total Broadband told TechRadar: "We're on the edge of 802.11n taking off. It's already standard in Apple's latest laptops for instance. "We did some research that showed that 40% of consumers were unhappy with the range of their Wi-Fi and the possibility of drop outs and obviously the N standard goes a long way to solving that. "We are always looking to bring our customers the most complete broadband experience and we felt the time was right for this upgrade." BT have also brought in parental controls, allowing access to certain computers to be cut off at certain times - something that is sure to bring about widespread annoyance to kids one frag away from success on late night Xbox marathons, but please the adults in the household. The box comes with WEP security out of the box – better that the older WPA protection and, although there may be older devices that will not now work, increasingly common. There is also a power save function that allows the box to be programmed to switch itself off at certain times to, erm, save power. And the price? Home Hub 2.0 will be free to new customers who sign up to a BT Total Broadband Option 3 contract. It's also included with Option 2 online orders. Existing customers can purchase the new Hub for £45, up from the previous £30 for the old hub. And those that went through the horribly convoluted set-up process will be delighted that this has now been heavily streamlined. If you're interested, you can put fingerprints all over the box from Friday 18th July.